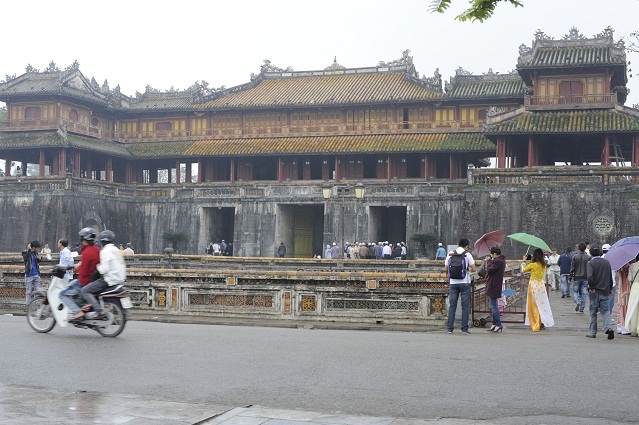 We went for all day with a motorbike driver each to visit diverse mausoleums and pagodas around Hue. We started the tour with another Japanese bridge. There was a story-teller on the bridge telling the future to a young girl. Although I couldn’t understand anything, it was fascinating to see her read her palm. 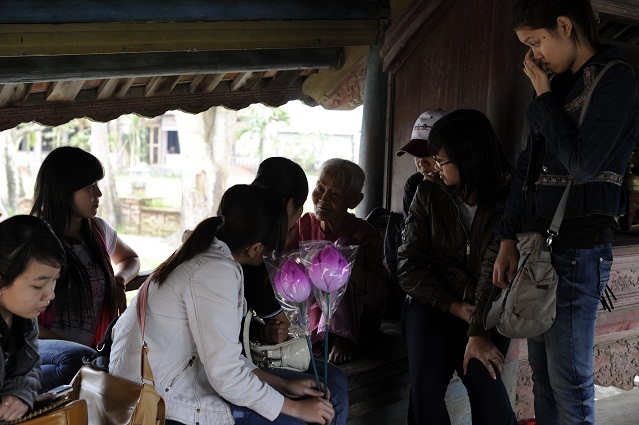 We continued with the visit of the Tomb of Khai Dinh. 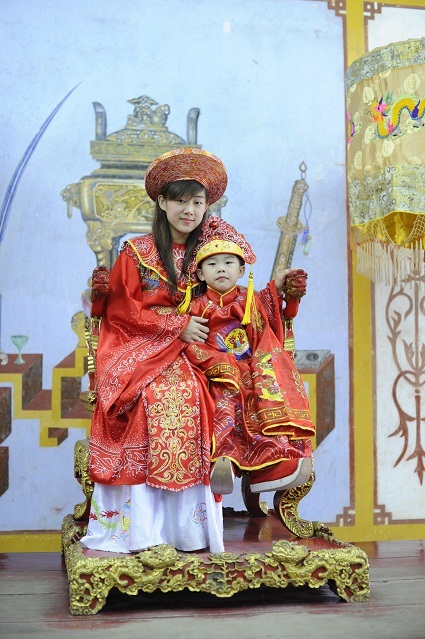 He was an emperor of Vietnam from 1916 to 1925 and widely seen as a puppet of the French. The construction of his tomb took 11 years. It is a gorgeous structure built on a hill. I was really astonished by its beauty, I had no idea this existed in Vietnam and apart from Angkor temples, I had not seen so beautiful building since the start of my trip! After climbing the first stairs, we arrived at the Honour Courtyard where there were mandarin guards, elephants and horses. 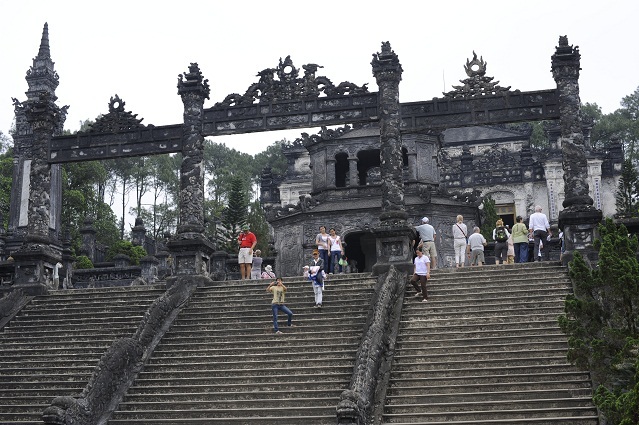 In the main building at the top, there was a bronze statue of Khai Dinh emperor. Apparently his remains are 18 meters below the statue. 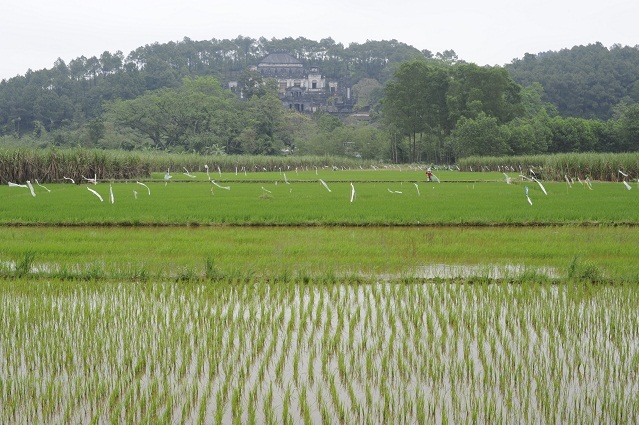 The landscape around was quite beautiful with a lot of rice fields. You can see in the background the Tomb of Khai Dinh. 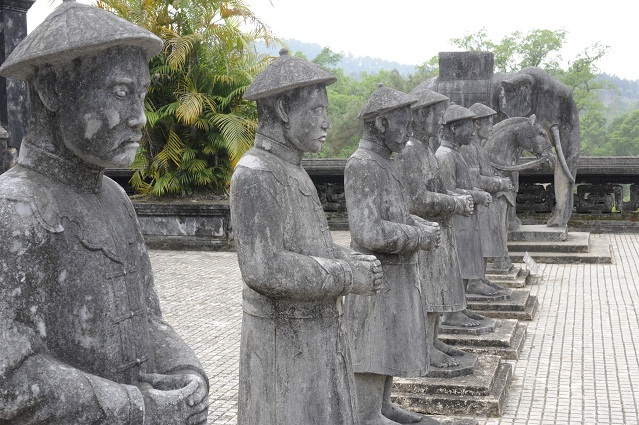 Then we went to see the Tomb of Minh Mang who reigned between 1820 and 1840. 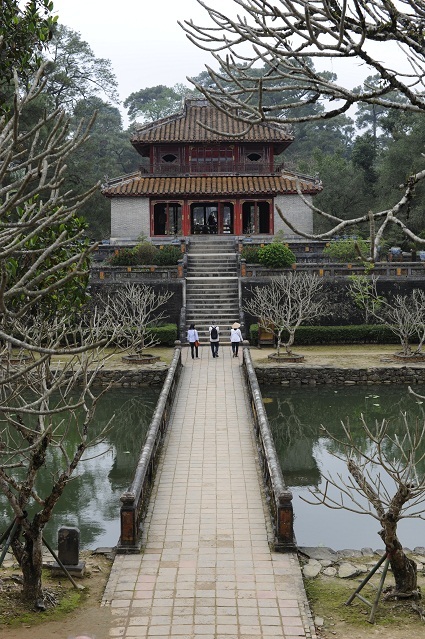 You need to go through several gates and terraces to reach the Sung An Temple dedicated to Minh Mang and his empress. 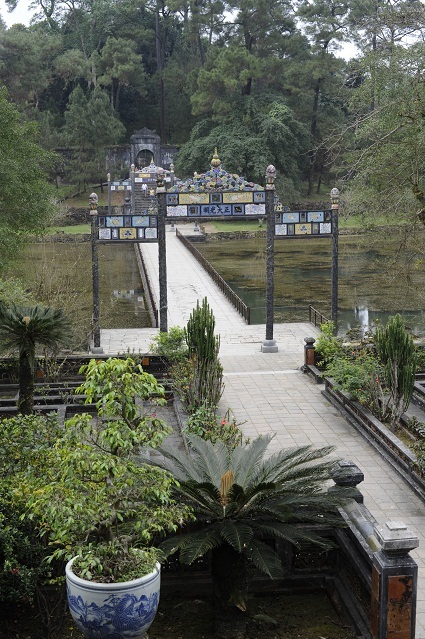 On the other side of the temple, a stone bridge leads to the hill on which lies Minh Mang’s sepulchre. 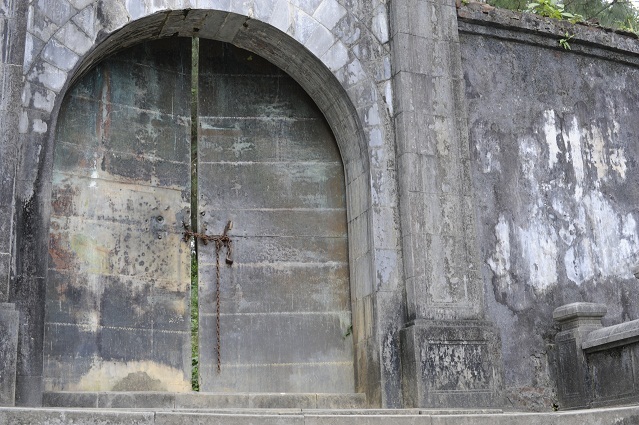 This mysterious gate which guards the hill is opened only once a year on the anniversary of the emperor’s death. 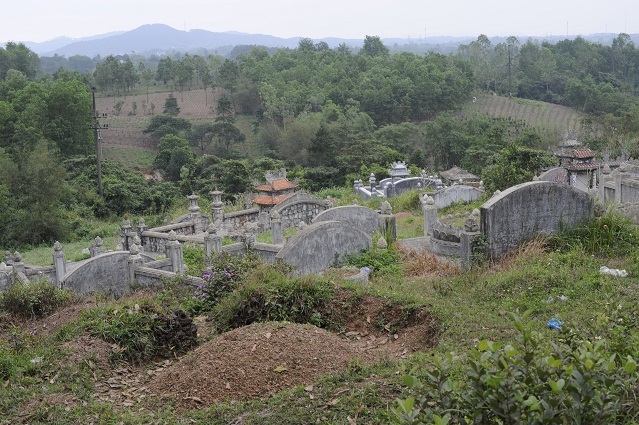 While leaving this beautiful Tomb, we ran again in Audrey-Laure and Olivier, the young couple we had met at lunch time in the restaurat in Hoi An. Funny! Then we continued the road. We saw some other tombs laid in a gorgeous setting. 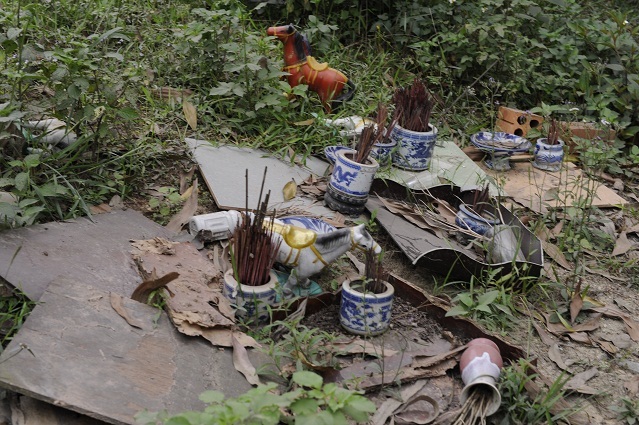 People leave a lot of offerings including incense and horses close to these tombs. 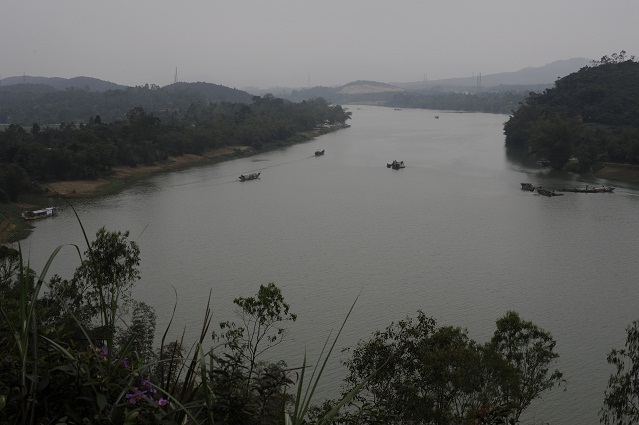 We went to a hill from which we had a beautiful view over the River of Perfume. 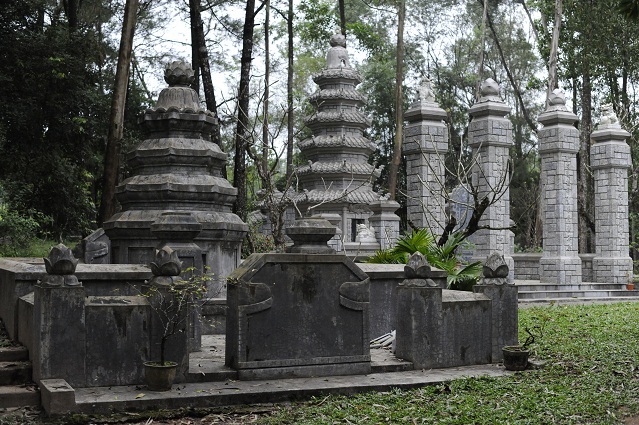 After that we had some lunch and went to visit the Tomb of Tu Duc constructed between 1864 and 1867. Apparently that emperor lived a life of imperial luxury. He had 104 wives and countless concubines, though no offspring. First I ran into these girls who completely burst into laugh when I photographed them. This is one of its monument, the Stele Pavilion which shelters a 20-tonne stone tablet. 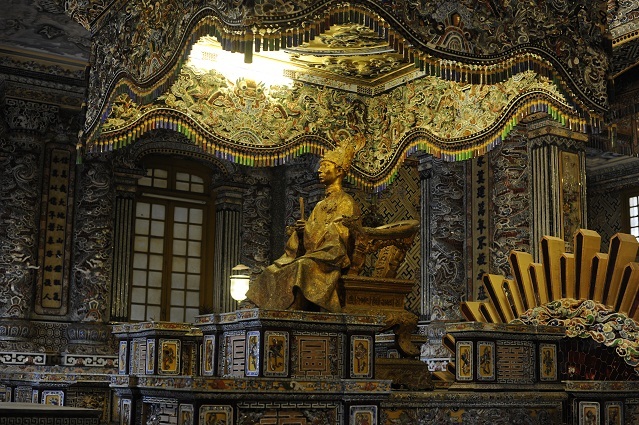 The cool story about this emperor is that although there is a tomb, he was never interred here in reality. The site where his remains were buried, along with great treasure, is not known. To keep it a secret from grave robbers, all of the 200 servants who buried the king were beheaded! How incredible to think that there are still places of legends with treasures that no one has ever found yet. Loved it! We ran again into Audrey-Laure and Olivier there. 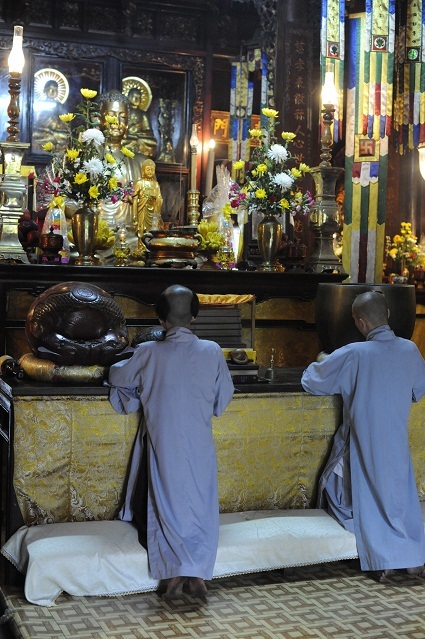 In one temple, there were monks chanting. 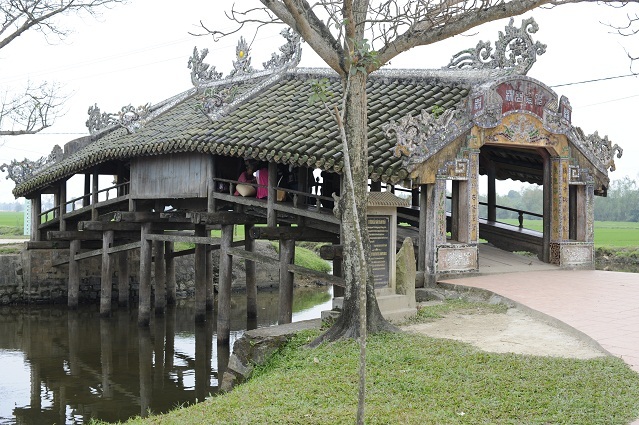 We crossed the river and went to see the last site, the Thien Mu Pagoda which is an icon of Vietnam and a symbol of Hue. 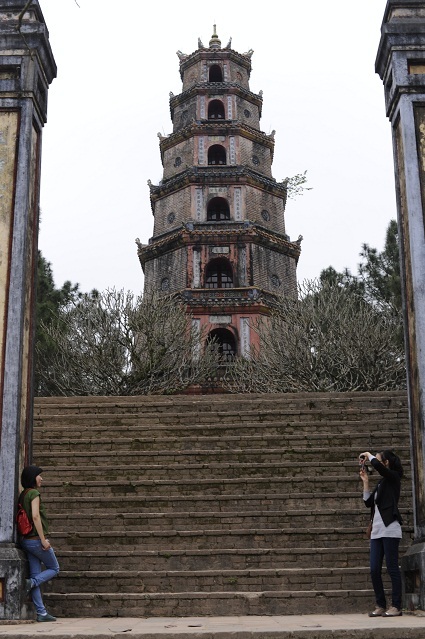 It has a beautiful 21-meter tower which was built in 1844. Each of its 7 storeys is dedicated to a manushi-buddha ( a Buddha that appeared in human form). 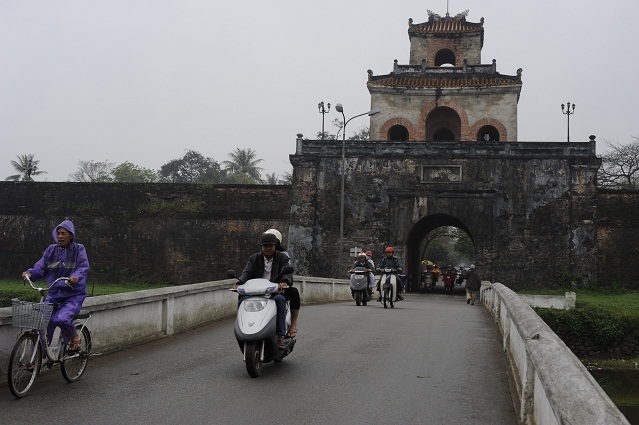 After that, we were exhausted and happy to go back to Hue! Sunday was a rainy day! 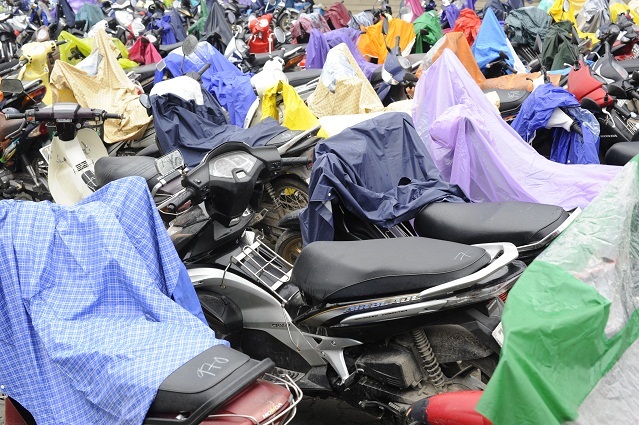 The motorbikes outside of the University were all covered with colourful raincoats. 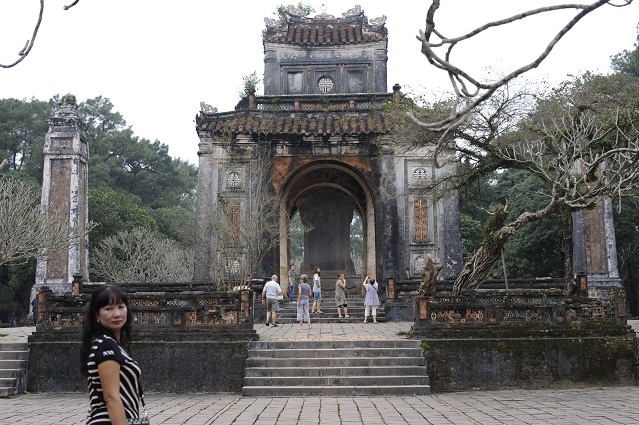 We went to see the Citadel of Hue, which has 2m-thick and 10km-long walls. It is a huge place. We went to visit the Imperial Enclosure, a citadel-within-a-citadel. 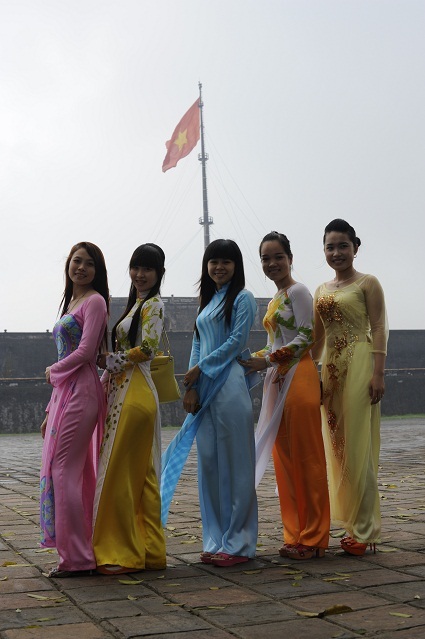 We saw many beautifully dressed Vietnamese women outside of it wearing a long colourful tunique. Behind you can see a glimpse of the 37-meter high Flag Tower which is the tallest of Vietnam. We entered by the Ngo Mon Gate, the principal entrance, whose central passeway was reserved to the Emperor before. The first building that we passed through was the Thai Hoa Palace, the Palace of Supreme Harmony, built in 1803, which was used for the emperor’s official receptions and important ceremonies. Behind that is a Hall of the Mandarins on the left, where people can dress up in imperial costumes to take funny photos. And more and more buildings…After the visit under a light rain, we took a taxi and went back to the hotel. We chilled out, had lunch and wifi nearby where we chatted with Hervé, a French-Vietnamese guy from Marseille who was currently working in Nantes and was travelling to Asia for the first time and spending 10 days only in Vietnam, as a kind of pelerinage of the places where his parents were from. Then we went to the railstation. 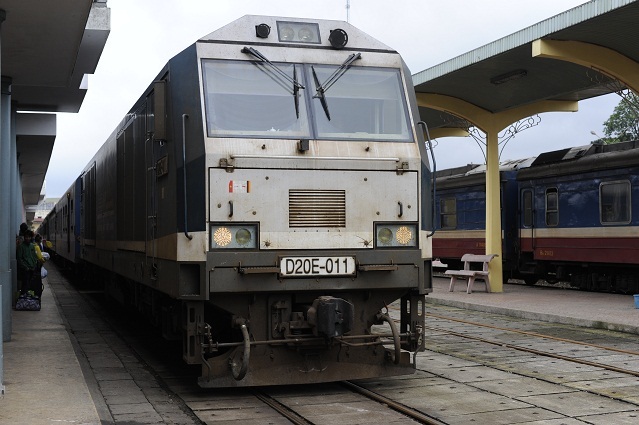 Here was our train going to Hanoi which left on time at 3pm with a planned arrival of 4am in Hanoi. It was the first train I was taking since I started travelling in Asia, as as far as I know there are no trains in Cambodia and Lao! Our trainmate was a very friendly Vietnamese woman who shared two oranges with us.